Today I wanted to show you a little texture trick. 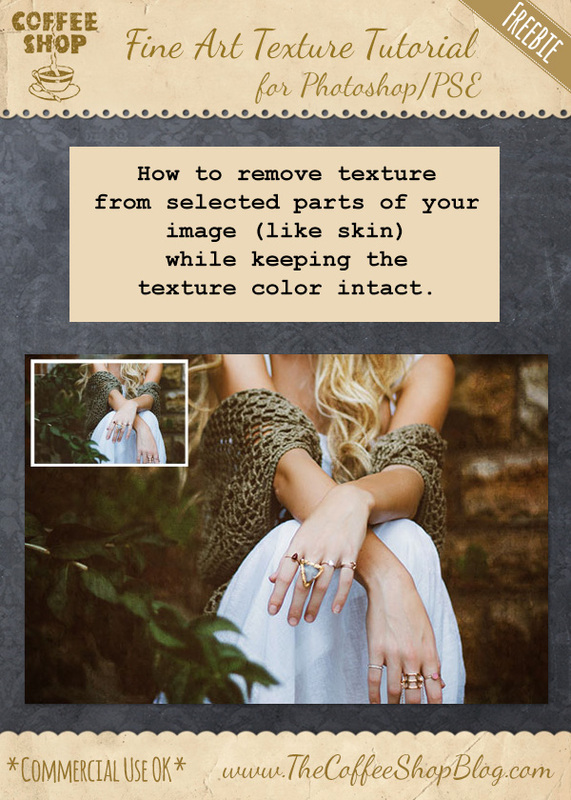 When you add a colored texture to your image, it will affect the entire color of your image. If you erase the texture off any part of the image, like the skin, you will also remove the texture color from this area which can look really odd. But there is an easy trick and I will walk you through it. Unfortunately when I made the screenshots for this tutorial I didn't realize that the differences wouldn't be that noticeable once I made them web-sized. I have a before/after example toward the bottom where the effect is more obvious. 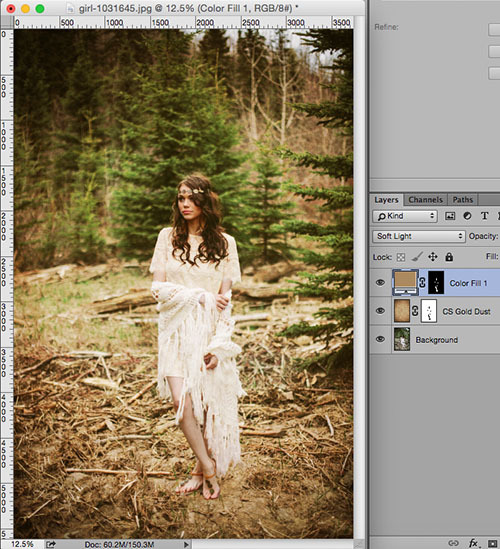 If you are adding a B&W texture you shouldn't have to go through these steps. 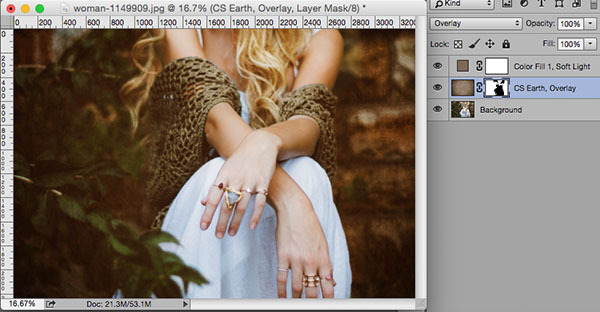 I am going to add the CoffeeShop "Earth" Painterly Texture to this image. You can download this texture here. When you add the texture, keep the blending mode in "Normal" and make sure the texture layer is selected before the next step. 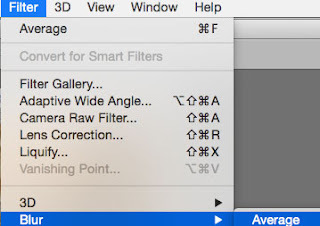 Go to Filter, Blur, Average. This step just blurs the texture colors into one color and allows you to select that color with the eye-dropper tool. 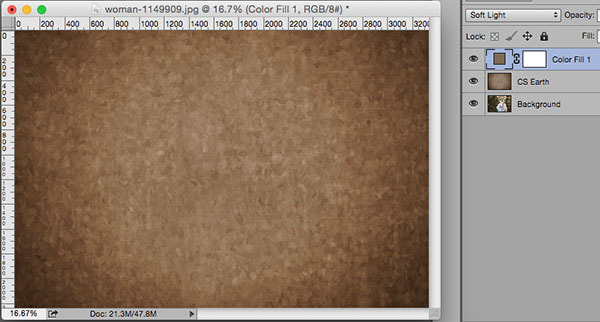 Then click on the Texture layer to select it and add a Color Fill adjustment. 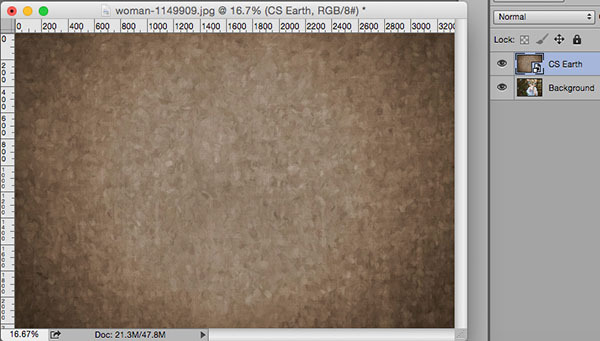 It will automatically add the averaged texture color you just selected (brown in this case). Put the Color Fill layer in Soft Light blending mode. Then put your texture layer in the blending mode of choice. I used Overlay in this edit. I don't like the texture effect her skin, so I will paint it off using a layer mask. I added a layer mask to the "Earth" texture layer and used a 50% soft black brush to paint the texture off her skin and dress. To see the red effect where you paint, click on the "\" key. Press "\" again to remove the red. 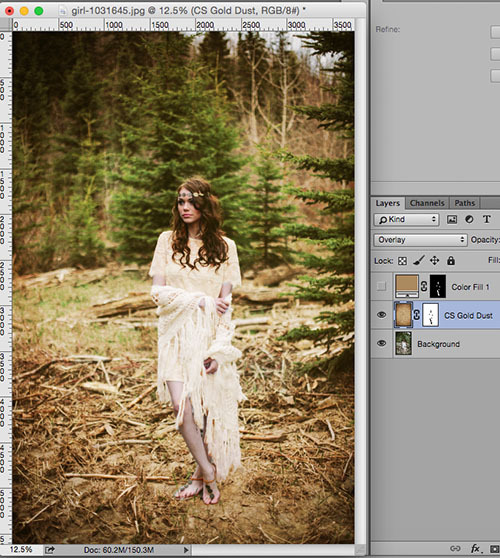 Now the texture is removed from her skin and dress, but I also remove the brown tint from the texture. 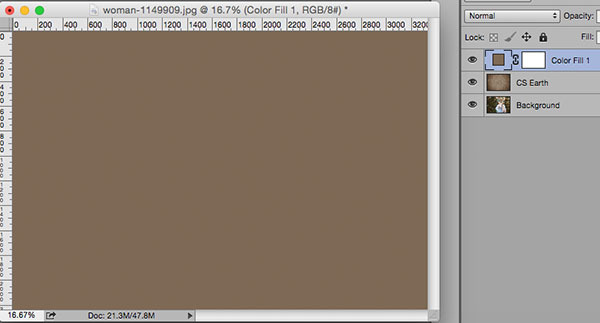 The Color Fill layer is also making the entire image much too brown. We will fix this! 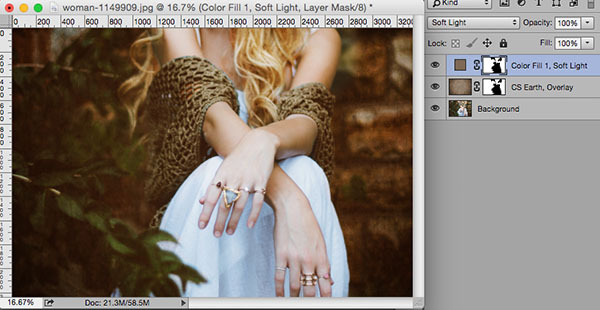 Alt/option-click on that layer mask and drag it up to the Color Fill adjustment layer. It should make an exact copy of that layer mask. Then select the Color Fill's layer mask and click cmd/ctrl-I to invert it. 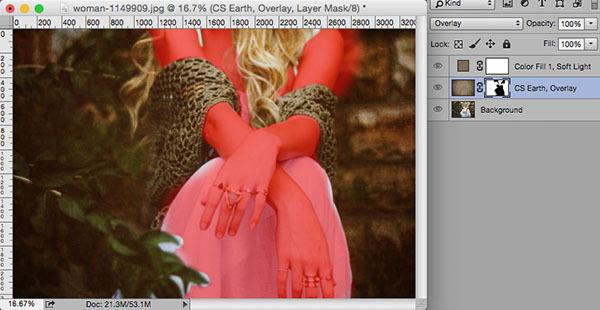 Now the Color Fill adjustment layer is only affecting the skin and dress. I have added back the brown tint of the texture without affecting the rest of the image. Now you can see her skin has more brown and looks better against the background. You don't have to copy the layer mask, you can paint on them both separately if you want. This is just a quick way to apply an inverted mask. 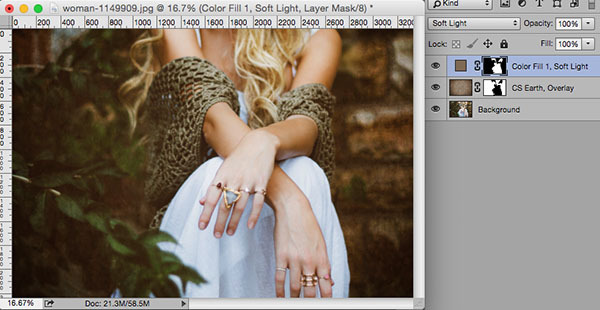 You can also adjust the Color Fill blending mode's opacity or change it to Overlay depending on each edit. I think this image's before/after is more obvious. You can see I added the texture and painted it off her skin. But as you can see, her skin's tone is too cold and doesn't match the background. I added the Color Fill adjustment layer as I did above, and now her skin matches the color tone of the background. I hope this tutorial is useful and you have fun playing with textures!